It’s summer and time to mow the grass. 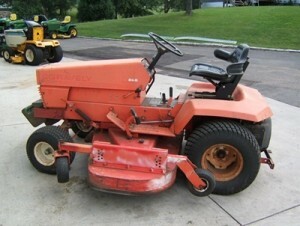 This old Gravely is what our neighbors use to mow all 3 of our country lawns. It just got repowered with a Vanguard engine. It’s ready to mow for another lifetime. It has a 72 inch mower deck. Yes, the neighbors mow our yard for us too. Starting up the mower decks sometimes uncovers needed repairs. Q: I just bought a used John Deere LX176 mower, The blades will not engage. When I brought it home today everything was working fine, however, when I turned off the blades to move to another area to mow, NOTHING. I called the mower shop where I purchased it and was told to replace all fuses, so I did, still NOTHING. I even replaced the PTO switch with a new one, still NOTHING, all wires are still connected. A: Check your safety switch in the seat. Check your safety switch on the brake pedal (if it has one there). Check the wiring into the ignition switch for corrosion. If all of that is not a problem hot wire to the PTO clutch itself and see if that works O.K. Q: Mowing season is here and after servicing my mower I now find that the mower on my Simplicity garden tractor starts and runs fine. However when I engage the PTO the engine stalls. I replaced the PTO dash switch and unfortunately this did not help. Do you have any suggestions or thoughts that might assist me with my troubleshooting? A: Yes, check out the wiring or the seat switch for an open circuit. Check out the hydrostatic switch and the switch on the brakes. Q: Is there an in line fuse for the PTO Switch in my John Deere LX176 lawn tractor? I have replaced the seat switch, the PTO switch, and the two fuses from behind the panel (steering)and the blades still will not engage. No wires were found disconnected. Does this leave the clutch to be replaced next? A: The first thing to do is temporarily hot wire your PTO clutch and if your clutch works O.K., then start checking into your tractor circuits and wiring. Q: I have a 455 John Deere Power shift which had a snow blade on front. I intend to cut grass with it and have removed the blade and hydraulics. The mowing deck was not with the tractor so I planned to fit one to a 3 point hitch and operate it off the PTO. Problem is, I cannot get the pto to engage. I pulled out the button on the dash and the dash lights up, but the shaft doesn’t spin. Do I need the mower fitted to the shaft before it will work? There is a handle at tbe rear beside the lift arms that has 3 settings, I am unsure as to its function. There is also a front driven PTO shaft, how does this engage? A: At one of the settings, it runs the front PTO only, at the next setting it runs the rear PTO only, at the 3rd setting it runs both PTO’s at the same time. Because the light comes on it sounds like there is an electrical magnetic switch problem in the rear end. Q: I have a John Deere 185 hydro. When I engage the blades they do not work. No noise, no nothing. What can the trouble be? Sounds like a switch to me. Any suggestions? A: First clean the wires that plug into the backside of your PTO switch, then check out the PTO switch itself. You can also run a hot wire to your PTO clutch and see if the clutch clicks in and out. Q: I have a John Deere F525 front mount mower and the blades suddenly decided not to work. The mower starts and runs fine, belts are ok, mower moves forward and reverse. Problem is when I pull the mower on switch, nothing. The belts don’t move, the blades no longer want to play. Everything works when moved by hand. I checked the fuses, and all are ok. Any suggestions as to where I might start to identify the problem? A: You need to check out your PTO switch, brake switch, and other safety switches. Also check for corroded or dirty wiring and connections. Check to see if electricity is getting down to the electric clutch. On the F525…………one more cut-off switch is the low pressure switch in hydraulic system. If you were running the mower and deck and then it suddenly stopped, it is most likely low pressure cut-off. It will not automatically reset as you are using the same volume for the drive pumps. Once the oil gets low enough, it will cut out the deck drive 1st and then the drive pumps. If your mower is older with high hours you most likley have some amount of oil consumption going on. Couple this with a partially plugged oil filter and you guessed it. Try fill the engine oil slightly above the high mark, let it sit for 30 minutes and try again. How do I know, you guessed it again, 1st hand experience. Q: The electromagnetic clutch on my john deere 330 will turn on for a half second and then shut off. Any suggestions? Check your PTO clutch coil amperage draw. It should be 3 amps or less. If it’s more than that you will need to replace the PTO coil.